Because things have gotten a bit too busy for crafting lately, I’m digging up an old project to share. 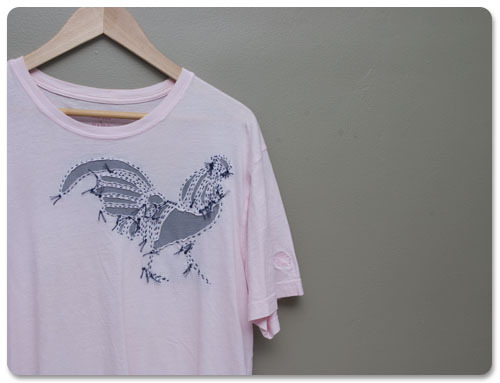 Regan’s Rooster Shirt. As I mentioned a few posts ago, I don’t make a lot of things for Regan. I have a box full of half-finished projects I’ve started over the past seven years and a bunch of other half-baked ideas brewing in my head. Lucky for me he’s patient. It’s also lucky that he is willing to wear home made clothing when I do get around to making it. Maybe he’s simply humoring me just because he’s such a swell guy, but I think he might actually enjoy what I make him. 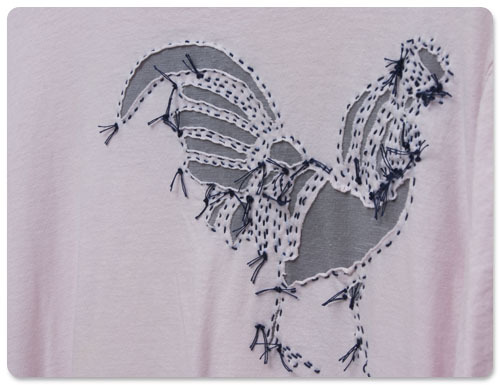 For this project I followed the Rooster Shirt directions outlined in the Alabama Stitch Book. Two summers ago my mom got me this book by Natalie Chanin, founder and head designer of Alabama Chanin. Natalie Chanin’s style and vision are amazing. Her examination of the South’s history of deep-rooted dependence on cotton as well as her cottage industry-style approach to manufacturing clothing changed my mind about how I thought about clothing. Between this book and this post by the amazing Kate Davies at needled, in 2009 I decided to not buy any clothing unless I was salvaging something from Goodwill or another second-hand store and giving it new life. It was a really easy thing to do and since that experimental year, my understanding of consumption in general has changed a lot. The Alabama Stitch Book not only speaks to the philosophy at Alabama Chanin, but also gives a great overview of supplies, techniques and projects. After reading the book from cover to cover I couldn’t help but make something for Regan immediately. And I can’t think of a better first project to have poured all my focus and careful hand-stitching into than this because, really, it’s a rooster! That’s happy, right? Oh yes! I definitely want a hand-stitched dino shirt…please make me one!